When I was a kid, watching Pink Panther reruns in the morning before heading off to school, my favorite character was never the big guy himself. Sure, Pink was cool, but kind of forgettable. No, I preferred the big blue anteater from The Ant and the Aardvark shorts. After the success of the Pink Panther character, DePatie-Freleng Productions was called upon to create a few more cartoons. On March 5, 1969, the adversarial pair debuted in a self-titled cartoon, following the predator/prey dynamic of such cartoons as Tom and Jerry or the Roadrunner and Wile E. Coyote. In their first adventure, Ant tries to raid an unattended picnic while Aardvark tries to catch him. Nothing groundbreaking, but audiences liked the pair enough that they would show up in 16 more shorts. For the Pink Panther's 40th anniversary, Palisades Toys created a small line of figures, including Pink, the Man, the Inspector and, of course, the Ant and the Aardvark. The otherwise nameless Aardvark, possibly the first anteater in pop culture (to be followed in 1977 by Cerebus and in 2002 by Sniffles), looks great. He's got the angry, frustrated look that he so often ended up with in the cartoon, as Ant foiled his plans. Sculptor Bill Mancuso did a great job capturing the look of the old toons - you can almost hear that Jackie Mason-style voice pouring out of his bent, wrinkled snout. Aardvark's 5 1/2" tall at the top of his crooked little ears and moves at the ears, neck, shoulders, wrists, waist and tail, as well as the points where his arms and legs emerge from his clothes. The paint job is good, but it had better be since he's pretty much all flat blue. His eyes and eyebrows are crisp, with no noticable spillage - that's something hard to do sometimes, but Palisades managed. Actually, not every Aardvark is flat blue - since Palisades loves its variants, there are two randomly-packed versions of this guy. The first has Aardvark in a red shirt and green pants, while the second is the Green Aardvark who showed up in "I've Got Ants in My Plans" and "Odd Ant Out." 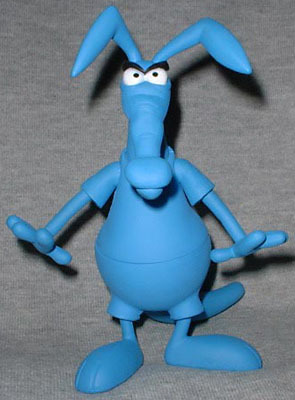 All the Aardvarks come with the same Ant - a little 2 3/4" accessory that moves at the neck and waist. 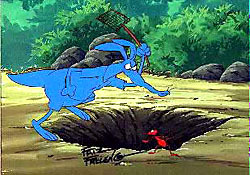 Sometimes given the name Charlie, Ant sounded as much like Dean Martin as Aardvark sounded like Jackie Mason (actually, both were voiced by Canadian comedian John Byner). The Ant has a smug little look on his face, which really suits the character. His sculpt is handled just as well as the Aardvark's, and his reddish-brown paint app is just as smooth - no overlap where the eyes meet the head. If there's any problem, it's that the Ant is too big in relation to the Aardvark. Sure, the pair were drawn in varying ways during their "lifetimes," but not anything like this. Still, it's a good thing Palisades did it - if Ant was any smaller, he'd be too easy to lose, and probably wouldn't be articulated. A bit of artistic license for more play value? Eh, sure, I think fans can accept it. 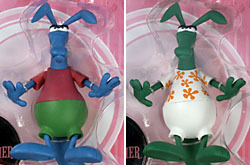 Like the early Muppet figures, the Ant and the Aardvark come with a generic logo base - theirs gets the Pink Panther logo, of course. I realize it's difficult to come up with accessories for characters who just chase each other around, but for a company that is usually so good about loading their figures down with extras, this set feels light. 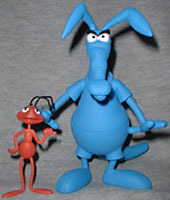 The Ant and the Aardvark - heck, the entire Pink Panther line - aren't really for casual buyers. Well, Pink might be, since he's the most recognizable, but the rest are aimed at fans who are already familiar with the show. Still, as niche collectibles, they're really well done and definitely worth checking out. Did we miss any famous anteaters? Tell us on our message board, The Loafing Lounge.